Growing Together Preschool partners with Community Action Council as a site for the Foster Grandparent Program. 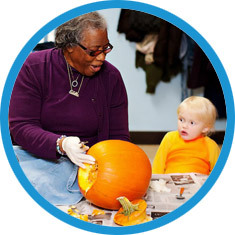 Volunteers in the Foster Grandparent Program work one on one with children who have special and exceptional needs. This partnership contributes to our commitment to diversity and inclusion by providing a way for individuals from different generations to interact and learn from one another.